I started my Saturday with a short trip to a meeting about school options in St. Louis City. It’s a pretty hot topic if you have kids and want to stay in the city, and I appreciated our neighborhood group going to the effort of getting representatives from a number of school options (public, charter, and parochial) all in one place. A local Catholic high school hosted the event. I was disappointed when this sign greeted me upon arrival. Ugh! So much for my hopes of finding a nice bike rack at the main entrance to the building. While I know this is not an uncommon occurrence, I feel like the tide against this type of signage (and the policies they represent, which discourage active transportation) is turning. This school needs to get with the program! I resisted locking Baby Jake to the column with the sign on it only because this column actually had a narrower metal pole behind it (hidden in the photo), which worked better with my U-lock. Fortunately, despite the sign, Baby Jake was still there, unmolested, when I returned. Saturday’s biking in mid-80-degree temperatures was also my first experience of warm (hot, really, in my book) weather biking with shorter hair. As I suspected, this in-between length (long enough to be on my neck, but too short to pull back completely) is not going to fly during hot weather. If I let it keep growing, I could probably pull it back by June, but I think I may take the plunge and really truly chop it for the summer, then, unless I want to keep it very short, I’d hope it would grow enough over the winter that I can pull it back this time next year. Since Matthew spends most Saturdays at the garden, Sunday is the only day all three of us have together, and we like to make the most of the time. We decided to laugh at the rain and bike to the Botanical Garden for a morning outing. We departed under looming rain clouds, and it was starting to spit just a bit when we made a doughnut detour a few blocks from the garden. After locking our bikes up, we had time for a little outside stroll in light drizzle, before ducking into the Climatron. While we were in the Climatron, the skies opened up, and there was a decent little shower, but we were nice and dry inside. I was wishing we had smartphones so we could check the radar and look for a break for biking home, but a quick peek outside showed clearing skies to the west. Not sure how long it would last, we headed back outside for a bit more walking before rendezvousing with our soggy bikes (well, mostly the helmets were soggy). We also had to dump the water out of the IBert (it pooled in both the back of the seat and in the foot rests — guess they need drainage holes! ), but it wasn’t a big deal. We had great weather for the ride home, and I was glad we didn’t let the clouds scare us into the car. Where did you ride over the weekend? This entry was posted in Biking, Health and tagged biking with kids. Bookmark the permalink. That’s a shame that they would have an antibike policy. 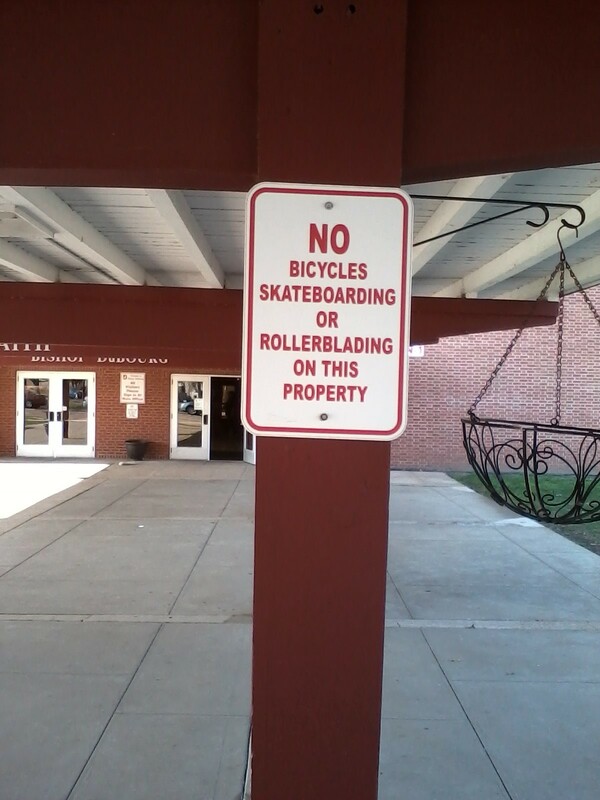 I understand the skateboarding and rollerblading with crazy kids. Maybe they need to make it more about no trick biking, not just no bikes. No matter the length of my hair, but particularly with short – medium curly hair, I prefer to always wear my hair pulled back in a bandana when exercising or biking. We love SLLIS for city school! Doesn’t start til K.
Jennifer, yes, I imagine it’s a liability thing. 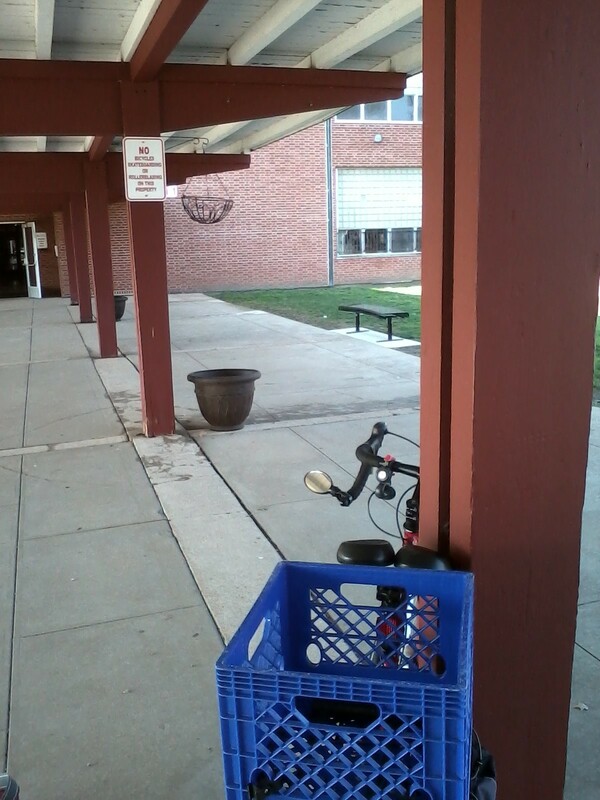 The combination of the sign and the lack of bike parking certainly discourages biking to school (or work, as I imagine there are teachers who live in the neighborhood, as well). We should talk about SLLIS sometime. It certainly sounds interesting, especially since they will eventually go through grade 12 (it seems most charter schools, at least at the moment, go through 8th grade at most), as well as the fact that they have an IB program. Though I must admit I’m tempted by the proximity and convenience of some of the South City magnet schools.